Ryan Strome is coming to the rescue for the slumping New York Islanders -- and fantasy owners should take notice. The 20-year-old forward was recalled Wednesday and could make his long-awaited NHL debut as early as Thursday when the Islanders wrap up their Western Conference road swing against the Phoenix Coyotes. 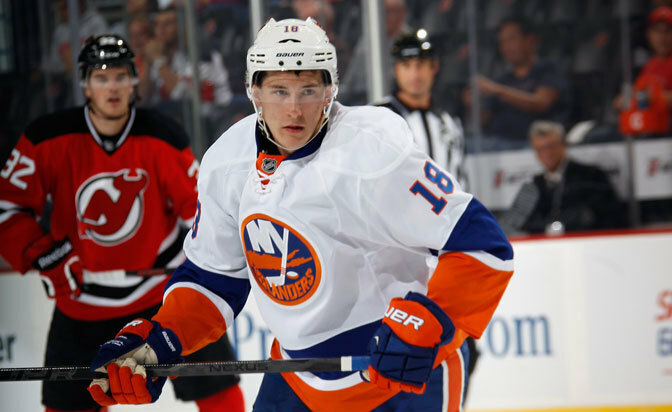 Strome came into the season as a fantasy sleeper pick, but did not make the Islanders opening-night roster. He has made his case over the past few months by leading the American Hockey League with 33 points for the Bridgeport Sound Tigers. His production at the Ontario Hockey League level in years past is also well-documented. New York, meanwhile, snapped a 10-game winless skid Tuesday in a 3-2 shootout win against the San Jose Sharks. The Islanders sit among the League's bottom-10 in goals per game (2.38) and power-play conversion percentage (16.0). If you put two and two together, it was a no-brainer to finally call up Strome. Strome, already owned in six percent of Yahoo Fantasy leagues, is center-eligible but also brings some right wing experience to the table for a team that desperately needs secondary scoring. Frans Nielsen, the Islanders' second-line center, was among the NHL scoring leaders in mid-November but has fallen off with three points in his past 13 contests. Michael Grabner, who had two goals on opening night, has not scored since. Josh Bailey has gone pointless over his past nine games. Pierre-Marc Bouchard was waived to make room for Strome. While preseason indications suggested that Strome could fit alongside the NHL's fourth-best point pair last season of John Tavares and then-Islanders forward Matt Moulson, the plot has drastically changed since then. The Islanders dealt Moulson to the Buffalo Sabres for Thomas Vanek in October. Though the team has missed Moulson's presence on the power play, Vanek has meshed well with Tavares and Kyle Okposo on New York's top line. Tavares and Okposo are tied for the NHL's sixth-most productive point pair, as they have recorded a point on 17 team goals. The duo of Tavares and Vanek has already combined on 10 team goals. In short, the top line is not the problem. Strome could be part of the solution. The losses have piled up of late, but the Islanders' top line is expected to remain intact. Therefore, fantasy owners should assume Strome will be given second-unit duties. After the Islanders took their time in getting their prized prospect seasoned in juniors and in the minors, giving him a top-six role puts him in the best position to help the team get its season back on track. As far as short-term fantasy value, now is the time to give Strome a chance if you have roster room in deep leagues. The best-case scenario is if he reels off 15-to-20 goals over the Islanders' 50 remaining games. The worst case is if he doesn't pan out, you could drop him in a few weeks. Strome's true value lies in keeper formats, where he's among the most coveted under-21 players. But, in either case, the potential reward outweighs the risk, so it would be worth your while to give Strome a test drive.